A few days ago one of my friend Abhilash asked me if he can use any Video Editors under Linux so that he can put an alternate sound track instead of that comes with the actual video. As I haven’t done anything like video editing under my Linux box, I began a search over the internet. The results were amazing. I was using the Avidemux for some video encoding purposes, but was unaware that I could do the job he asked; using the Avidemux itself. But there are several other video editors for Linux they are. Avidemux is a free video editor designed for simple cutting, filtering and encoding tasks. It supports many file types, including AVI, DVD compatible MPEG files, MP4 and ASF, using a variety of codecs. Tasks can be automated using projects, job queue and powerful scripting capabilities. Avidemux is available for Linux, BSD, Mac OS X and Microsoft Windows under the GNU GPL license. The program was written from scratch by Mean, but code from other people and projects has been used as well. 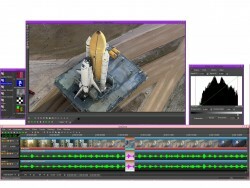 Heroine Virtual Ltd. presents an advanced compositing and editing system for native Linux at no cost to users. Cinelerra does primarily 3 main things: capturing, compositing, and editing audio and video with sample level accuracy. It’s a seemless integration of audio, video, and still photos rarely experienced on a web server. Cinelerra is the most advanced non-linear video editor and compositor for Linux. It is developed by Adam Williams (formerly known as Jack Crossfire) at Heroine Virtual Ltd.. To know more see the official Cinelerra home page and the SourceForge project page. LiVES mixes realtime video performance and non-linear editing in one application. It will let you start editing and making video right away, without having to worry about formats, frame sizes, or framerates. It is a very flexible tool which can be used by both VJ’s and video editors – mix and switch clips from the keyboard, trim and edit your clips, and bring them together using the multitrack timeline. You can even record your performance in real time, and then edit it further or render it straight away as a new clip ! NOTE: You can install them via Synaptic Package manager.